Sony has announced in this week’s PlayStation Plus update that Soul Calibur: Broken Destiny for the PSP will be added to the North American free Instant Game Collection later today. Now, there is a good chance that the vast majority of PlayStation Plus subscribers are not going to be all that thrilled by a free digital copy of an old PSP fighter (even if it is supported on the PlayStation Vita and has Kratos as a playable character), and who can blame them? We can all clearly see the superior game selection that European PlayStation Plus members have been enjoying across the pond. If this describes you, worry not, because this week’s update also brings with it some nice Spring Fever discounts for Plus members. 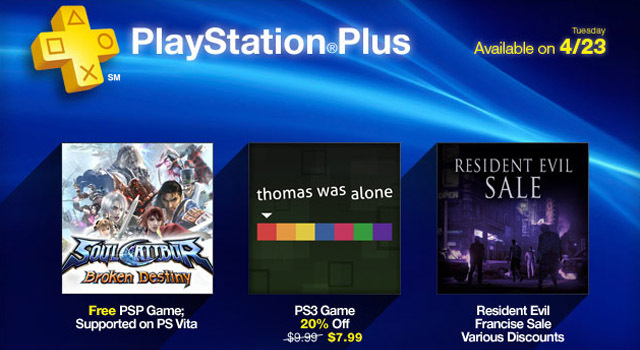 For starters, PlayStation Plus subscribers will be able to get a 20% discount on the indie title Thomas Was Alone during its launch week. If you have not yet heard of this little puzzle platformer, don’t be fooled by its basic appearance, as there is a surprising amount of depth to the game and its narrative. If you are a fan of the genre, this is one game you don’t want to miss out on. The PlayStation Plus free game may have been a bust this week, but at least there are some nice deals included in the Spring Fever sale. Let us know what you are planning to pick up down in the comments.